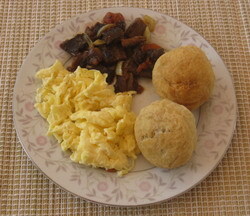 Some Jamaican recipes, like the Johnny Cake, were handed down through generations. Others rose to fame rather quickly - Festival is one of these later additions. Both are a type of fried dumpling. Johnny Cakes (originally journey cakes) have been around from the days of slavery, and have remained popular as a breakfast item, substituting for bread. They are easy to pack, and were often included in a working man's packed lunch. St. Catherine (I think it was in the 1970's or 80's), and quickly made its name as an important sidekick to fried fish, and later to jerked chicken and pork. It was so popular that it soon began to be served throughout the whole island. Sift flour, baking powder and salt together into a large bowl. Cut in butter lightly. Mixture should look like crumbs. Gradually add water, kneading until a smooth, firm dough is formed. Divide dough into balls, about a tablespoon in size. Knead each one lightly. Flatten each ball slightly, then fry in hot oil. Serve hot. Can be eaten whole, or cut in half and spread with butter or margarine. Great with Ackee and Saltfish, and other breakfast dishes. Mix all dry ingredients together in a bowl. Make a well in the middle of the dry ingredients. Pour milk a little at a time and mix to form a stiff dough. (Some milk may be left over.) Knead lightly. Roll into long dumplings, about 1" by 4". Some people like bigger festivals, but this size is easy to cook through. Deep fry in hot oil, about an inch deep, until golden brown. Drain on paper towel. Especially delicious when served hot.